This is part 3 of my solo-braider double-braid tutorials, on the hollow, or tubular version of the double braid. Part 1 covers the basic instructions and Solid Rectangle double braids; Part 2 is on Flat double braids. I didn’t make a video for the hollow braid – the method is so similar to making a flat double braid that you can use that video to learn the hollow braid as well (read what the minimal difference is first). If you are new to loop braiding, start with my intro tutorial on 5-loop square and flat braids before learning double braids. I’ve posted a separate page of set-up instructions for all the color variations of hollow braids in these photos (that link is also available directly following the braiding method). You will probably think of the sides as the ‘top’ and ‘bottom’ of the braid after it’s done, because they are the widest surfaces. That puts a different section of the braid in the center-view. A color set-up that would make a zig-zag pattern in a solid rectangle braid, would instead have mirror-image symmetry in this hollow rectangle braid—like X-shapes going down the braid (the ‘X’ shapes can look a bit like eagles, or maybe lobsters). 2. The second reason for very different patterns specifically applies to bicolor loops. 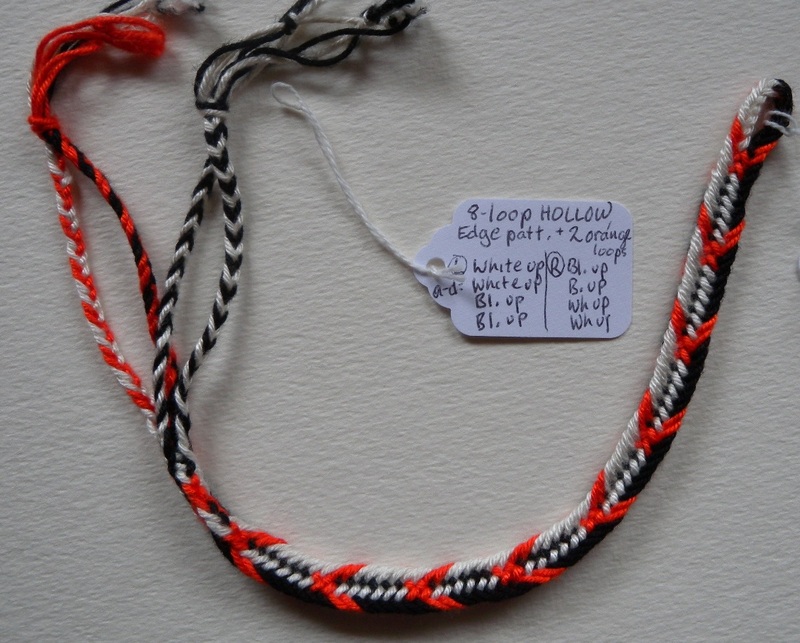 In the hollow braid, only two of the four loop transfers of each cycle are turned, instead of all four of them as in a solid rectangle double braid. Whenever a bicolor loop is turned it results in a color change to the braid, so these two braids can have quite different color patterns when you use bicolor loops. In my lingo, Edge patterns are those bicolor loop patterns in which the lengthwise columns of the braid keep to one color, without the braider having to do any extra braiding moves (i.e no ‘linking’). The braids in the photos above are actually all slight variations on the ‘pure’ Edge-pattern. They all are made with (mostly) bicolor loops, set up to create lengthwise dark-light columns. ‘Edge’ patterns of lengthwise striping in square and double braids are only possible for those that have an even number of turned loop transfers in each cycle of moves. So there is no Edge pattern for flat braids, as they only have one turned loop transfer (unless you use an extra ‘linking’ move, see my posts on color-linking!). The Hollow Rectangle double braid is truly hollow (if you’ve remembered not to turn any of the inner loop transfers! ), so you can easily change it from a flattish, rectangular shape, to a round shape. Insert a fine knitting needle or maybe a shish kabob skewer into the braid and squish the braid up and down to help it fill out. Hollow double braid of 9 loops, no longer rectangular. This is its rounded, “puffed-out,” form, after inserting knitting needle. Embroidery floss and shiny rayon thread. The braids that probably jumped out at you are the ones with the open areas! 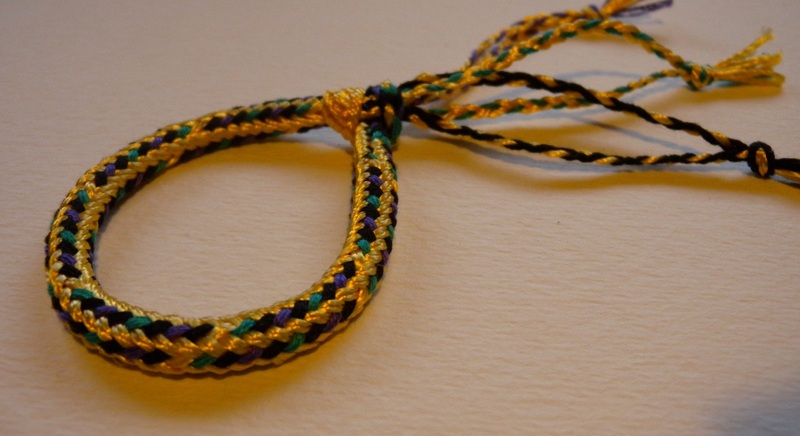 And since the braid is hollow, anything you string through the braid will show in that opening! 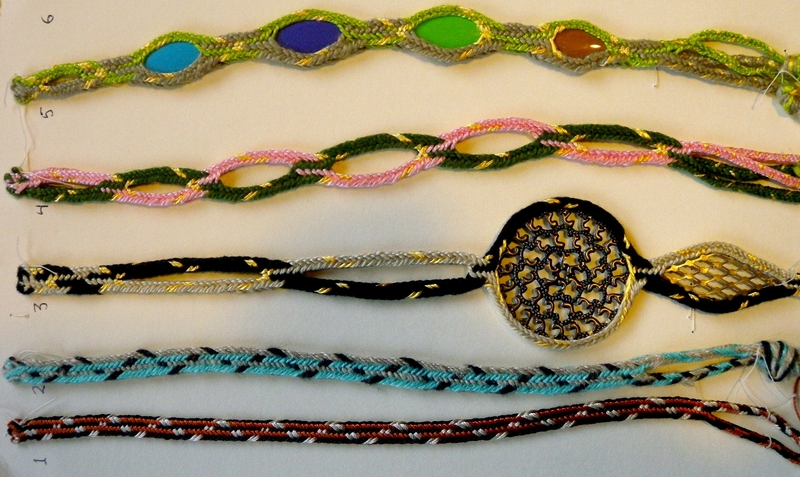 Ribbons, another braid, beads, etc. Plus, the sides of that keyhole are cupped, and will hold onto a flat object of the right size, especially if it is oval, diamond-shaped, or best of all “eye”-shaped (like an oval but pointed at both ends…is there a name for this shape? it seems like such a basic geometric shape, but I can’t think of a word for it!). I’m not crazy about the colors I used, but I like the inserts. They were some thin, flat metal scrap-booking ornaments (eye-shaped) that I happened to come across, with English words on one side and Chinese characters on the other. The braid above was made with more loops than those in my tutorials, but 8 and 10-loop hollow double braids have the same possibility, maybe with the added security of a little glue to hold the inserted elements in place. Judging the size is important, too. It’s best if the opening is small enough that it’s difficult—but possible—to insert the flat object. The object should not be very thick, and it will hold best if it is pointed at the top and bottom. That large, round insert in the upper photo would probably need some glue if it were used in an actual piece of jewelry. I didn’t glue the inserts in the bracelet, though, and I’ve worn it many times without having any of them fall out. The first loop transfer is not turned, and the second transfer is turned, on both hands, instead of just the right hand. Watch the video for the flat double braid, but WAIT past the left hand moves, to see how the right hand moves are done. For a hollow version, you need to do the loop movements of both hands exactly the way I demo them for only the right-hand loops in my flat braid video. (Btw, the very last move of the braid – the loop-exchange move between the two little fingers – is not one of the four loop transfers. It is done only once – after the 2 left and 2 right loop transfers are finished). I now have a video demoing how I make 12-loop hollow double braids. Same concept, but it’s a lot more complicated with the loop-shifting for so many loops. Twelve loops is a next-step after learning how to manage thumb-loops in a 10-loop double braid (taught in both my previous double braid tutorials). However, whichever method is used, the resulting braid is hollow—it is just an artifact of the tightening that causes it to flatten one way or the other. The braider is free to manually re-flattened it on any axis after it is made. This is something I only discovered in the summer of 2013, when I was videoing Amy and Patrick making a double braid together! I had always made my double braids as a solo braider up until then. I had certainly noted and wondered at first why the hollow and the flat versions both braided “tall” — that is, folded into a vertical rather than horizontal shape while being braided — and ended up realizing it was because the tightening move pulled the two edges inward. 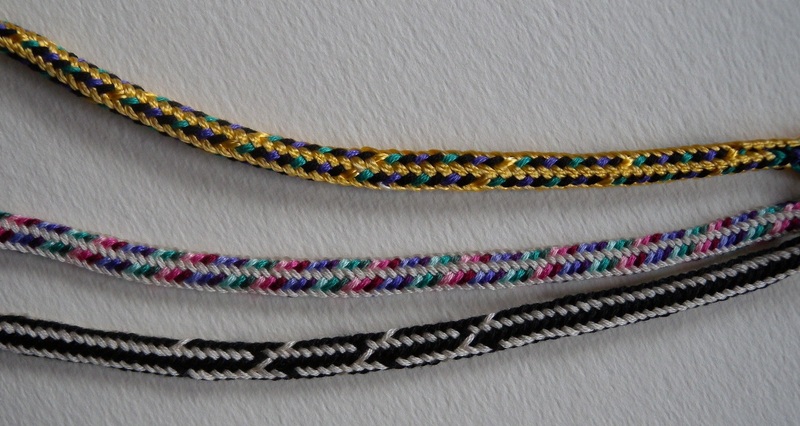 Unlike the other forms of double braids, there are no turned (“crossed” or “reversed”) loop transfers in the center of a flat or hollow double braid to hold the upper and lower layers together. But it never occurred to me to wonder if that might not be the case if the braids were made by two braiders working side-by-side! It turns out that when two braiders braid this braid together, the two far edges don’t get pulled together when the braid is tightened. (The two far edges being the left braider’s left edge, and the right braider’s right edge.) That would only happen if no tightening were done by the two braiders until after they exchanged their nearest loops—each pulling all their loops against the other braider’s loops to tighten. This might be possible to do (? ), but it is much easier and more natural for each braider to tighten their own half of the braid, before exchanging their nearest loops with each other. In that case, each half of the braid is tightened separately, so the two far edges are never pulled together. The braid is mostly all tightened up before the loop exchange even occurs. I wish I could add this into my double braid article in Threads that Move! (proceedings of Braids 2012, see top of my sidebar.) That’s one advantage of writing on a website rather than in a physical book – I can come back and edit it whenever I want. My article in Threads That Move covers many more types of double braids than I teach here on the blog, but I can’t go back to it and edit anything! See full copyright restrictions and permissions at the bottom of the sidebar (if you are on a small screen, the ‘sidebar’ may appear somewhere other than at the side). I LOVE your site. I have been doing very basic loop braiding for about 30 years. I learned from a old college roommate. 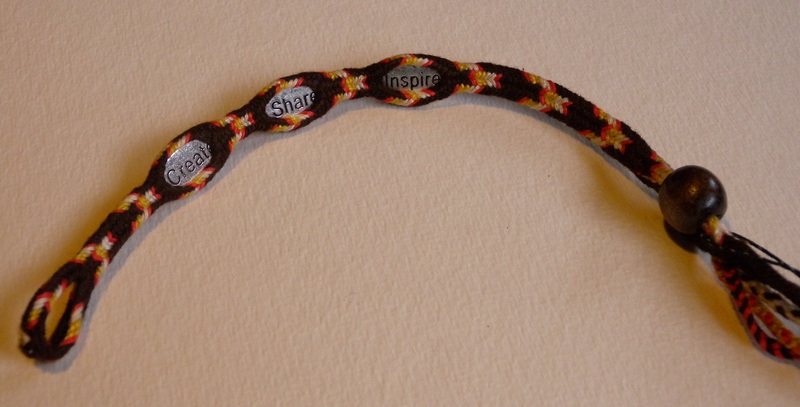 She followed the Grateful Dead around for years and made bracelets to support herself. So braiding served her well. I kind of think of this blog as my ‘book’. If you click on the Tutorials tab in my header, you’ll get a ‘table of contents’ for all the tutorials. Other non-tutorial but informative ‘chapters’ are listed under the About tab. Btw, if you’ve only looked at the Start Here tutorial, that and the 9-loop tutorial were my first and worst videos – once you get past those, I think subsequent ones are better quality! If you click to ‘follow’ this blog at the top of my sidebar you’ll get an automated email announcement when I publish a ‘chapter’ – usually 0 to 2 times a month, with sometime several months in between. 4 to 8-loop Spiral braids; the 2-loop braid (this 2-loop pdf is an essential ‘chapter 1’ for all the spiral braid pdfs – teaches the basic move for all of them); and the 3-loop version of the square braid. Yay! Thank you!!! I had come across the word marquise since posting this, but wasn’t sure about it and did not know about ‘navette’ and lenticular. You must have taken a nice relaxed route to the conference if you left as early as last Tuesday! I am rushing around to get ready now, hope to meet you there. I can’t make it up until Wed evening due to family health reasons, but will be there til Sat morning. Thanks again for the shape info! Thanks Carol! that wiki link also had another link to an art-history word relating to this shape – the Italian word ‘mandorla’ (for ‘almond’) for the vesica piscis shape when it’s used as a frame or sort of whole-body halo in religious art… Thanks for enriching my vocabulary! You are a marvel. I am in love with loop braiding through your posts. At present I am too busy to take it up in earnest. As soon as I have a little time I´ll be practicing like mad. Hi Edita, thanks for the nice notes! I’m so glad you’re enjoying the posts!